Pick up this model and you WILL be noticed! The Ltd. Ed. Epiphone Elitist Twisted Sister Les Paul Standard – Pick up this model and you WILL be noticed! It starts with the premium Elitist LP Standard and then adds Gibson USA Burstbucker pickups and Twisted Pinkburst finish. Features include “Twisted Sister” Bone logo on the headstock, Jay Jay French’s name on the truss rod cover. Fully professional-quality guitars non-professionals can afford, musical instruments of impeccable quality and beauty. 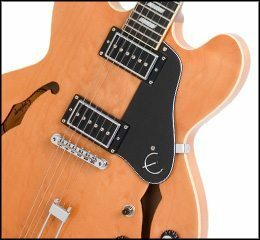 End of Epiphone Elitist Twisted Sister Les Paul Standard guitar Reviews :: Electric Guitar Reviews.